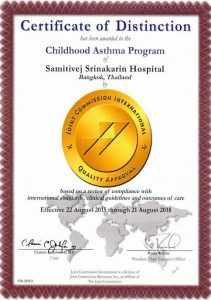 Childhood asthma care: we are extremely proud of our record in childhood asthma care under the international pediatric asthma care guidelines and particularly that we have received certification from the JCI for our Clinical Care Program-Childhood Asthma at Samitivej Srinakarin in 2012 and 2015. For the past seven years none of our childhood asthma patients has suffered from asthma exacerbation which has required intubation or critical care in the Pediatric ICU and 0% of patients have been readmitted with an acute asthma attack. Samitivej’s Bangkok Allergy Center offers high quality child allergy treatment in Thailand. Our facility is fully-equipped with the state-of-art technologies. Our innovative allergy treatment in Thailand offers services to both locals and international patients. If you’re looking for a comprehensive, award-winning care for children allergy, come to our internationally qualified Bangkok Allergy Center. Provide diagnosis and treatment for patients with allergic disease, such as asthma, hay fever, atopic dermatitis, food allergy, drug allergy, and chronic sinusitis due to allergy. Conduct skin prick test ( to determine because of allergy ), nasal cytology (to differentiate the allergic rhinitis from non allergic rhinitic), lung function test, etc. Provide diagnosis and treatment for patients with immune deficiency since birth, excluding AIDS. Provide education on allergic diseases, how to avoid allergens, how to use nasal spray and inhale mediations, how to wash nasal cavity. Assoc. Prof. Weena Phuthongkam, M.D. Clinical Professor Srisupalak Singalavanija, M.D.